Welcome to another to Becoming A Modern Man! In this article I am looking a deck based around one of the most broken mechanics in Magic's history - Dredge. 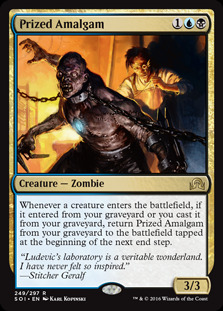 The deck abuses the graveyard filling it with various creatures that return from the graveyard and then trounces the opponent with a flurry of creatures. My list is a mismash of existing lists that I found. The sideboard in particular is a bit messy and needs more Collective Brutality but I did not have access to those at the time. 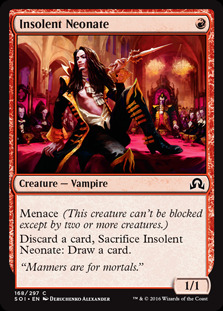 Neonate rapidly became a staple of Dredge decks. It's a one-mana creature with menace which is actually a decent little package in itself. 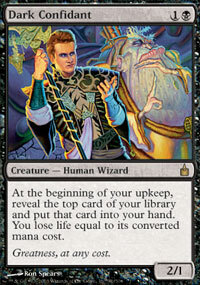 However, the really relevant part is that you can sacrifice and discard a card to draw a card. Combined with a Dredge card this allows you to sacrifice Neonate and discard the Dredge card to immediately Dredge back the card you discarded. This is a speedy way to pitch a lot of cards into your graveyard and get Dredging as early as possible which is very important to the deck. One of the key cards of the deck. 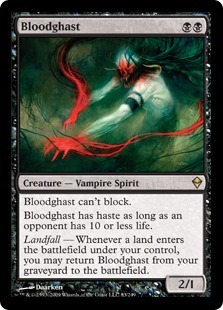 Bloodghast is an easily recurrable threat that just requires you to play a land to get it back from the graveyard. It's one of the easiest ways to get Prized Amalgam out of the graveyard and probably the most common. It's a 2/1 threat which gains haste once you get your opponent down to 10 life which makes it all the more problematic for the opponent. 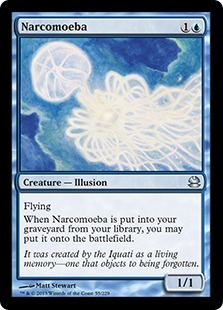 Narcomoeba is something of a dead card when drawn as we can only cast it off of a Gemstone Mine . 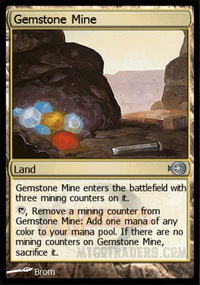 However, if we happen to Dredge it out of our library into the graveyard it will return from the graveyard to the battlefield and in the process trigger any copies of Prized Amalgam in there too. 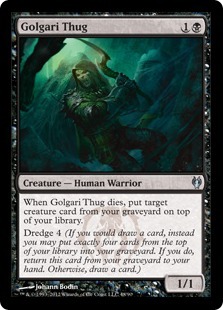 Golgari Thug is another dredge creature. 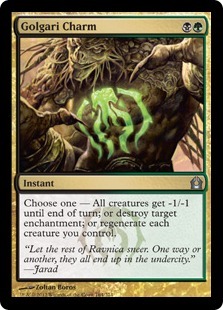 It doesn't dredge quite as deeply as Stinkweed Imp and so generally isn't quite as valuable but you need a good number of dredge cards in the deck to make sure you are dredging as often as possible. Not as useful a creature on the battlefield as Stinkweed Imp but can provide a chump blocker if necessary. Imp is the Dredge card with the biggest dredge ability, dredging a massive 5 cards into the graveyard each time it is returned to your hand. 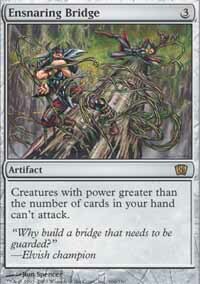 As such it's generally the best dredge card to have in your graveyard. As I mention, and you will see, in the videos Stinkweed Imp is actually a fairly underrated creature in its own respect too. A recurring flying deathtouch creature is actually a great answer to most of the creatures in the format so if you are put on the defensive be aware that actually casting Stinkweed Imp can be a solid play. Amalgam is a key card for the deck and a lot of the cards in the deck are there as ways of getting Amalgam out of the graveyard and into play. Bloodghast is probably the easiest and best means of getting Amalgam out of the graveyard but we also have Narcomoeba and Haunted Dead . Haunted Dead adds to our collection of creatures that we can get back to the battlefield from the graveyard. 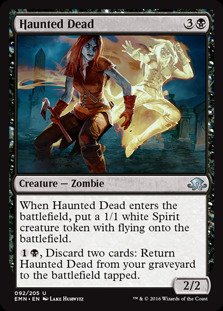 Haunted Dead also doubles up as a discard outlet for the deck while adding two threats to the board. There are varying options in this slot and I have seen decks run Scourge Devil and various other cards but personally I am a fan of (Haunted Dead). 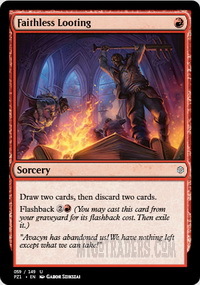 Faithless Looting is one of the key enablers for the deck and arguably the most important card in the deck. A turn 1 Faithless Looting can do a great deal to set up your future turns. Also, you can use flashback to use it again later. Later in the game you can exchange the draws Looting offers for dredging and really pile up your graveyard. Realistically you want one of red discard spells in your opening hand, otherwise it's probably a mulligan. Looting is probably the best of the them though. That said as you draw the card before you discard them you will not be able to immediately Dredge and will just instead be pitching your Dredge cards. 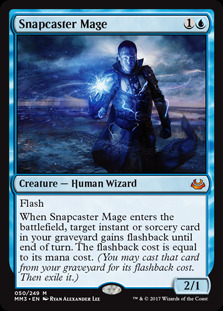 Darkblast is a nice removal spell that can kill a lot of relevant creatures in the format, including Snapcaster Mage , Young Pyromancer and Dark Confidant . It's not as valuable in some matchups though so it's not an essential part piece of the deck. 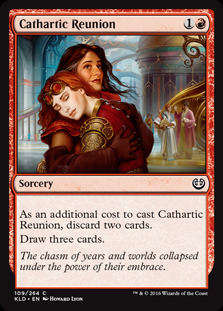 Reunion is our third red discard outlet. It's the most expensive of the available options but very powerful. As you discard first, you can discard your Dredge cards and then immediately Dredge them back to maximise the number of Dredge effects. Drawing three cards is huge and even if you only have one Dredge card in the graveyard you can always hope to Dredge into more Dredge cards for the graveyard. Conflagrate is a card that really shines in this deck and can be incredibly powerful. Thanks to Life from the Loam the deck can fill its hand with lands to power up Conflagrate and obviously by the nature of the deck a lot of your cards perform well in the graveyard. 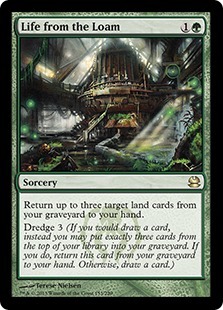 Loam is a great dredge card that helps you restock your hand with lands that can then be used to pay for the discard payments of our other cards. 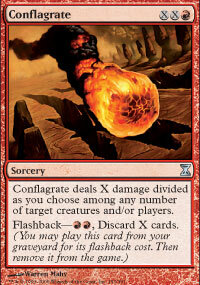 This is particularly potent with Conflagrate s flashback as each additional card in hand is another point of damage. Mine is a useful land as it can produce any colour of mana and gives us a way of hardcasting Narcomoeba or Prized Amalgam in a pinch. You can also get Mine back after it's out of counters with Life from the Loam . The Dredge land. 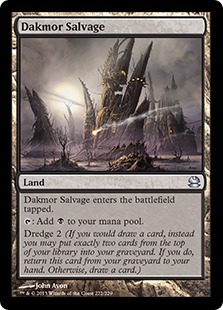 Salvage is one of the lesser Dredge cards in the deck but really it's a case of the more the merrier and in a pinch at least it gives you a land to use. 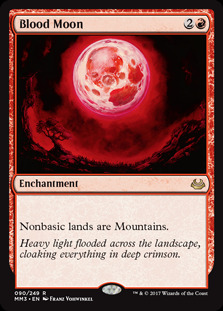 It also means you can ensure you get a Landfall trigger for your Bloodghast if your hand is otherwise empty of lands. 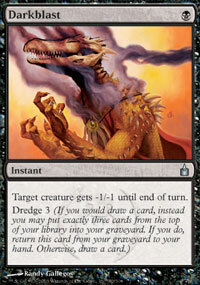 Sideboarding is difficult with Dredge as you cannot afford to take too much of the core elements out. Additionally, the intention with Dredge decks is to Dredge as much as possible as early as possible and most of the sideboard cards will not be useful sitting in the graveyard. Collective Brutality is a very good sideboard card for Dredge. It provides a good discard outlet while also providing valuable effects. Ancient Grudge is powerful artifact hate which has the advantage of actually being playable from the graveyard. 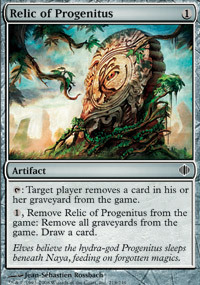 Abrupt Decay provides an answer to problem hate cards like Relic of Progenitus and Rest in Peace . 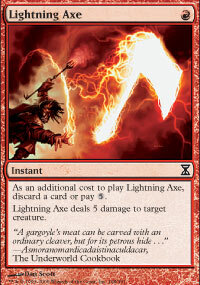 Lightning Axe is a nice answer to creatures like Gurmag Angler , Hollow One and also smaller threats while providing an ever useful discard outlet. Thoughtseize is a useful tool against combo decks and as a way of proactively dealing with hate cards. 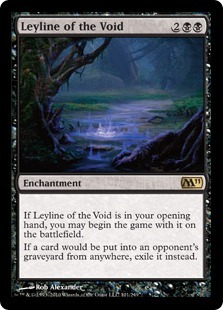 Leyline of the Void is graveyard hate for opposing graveyard-focused decks. 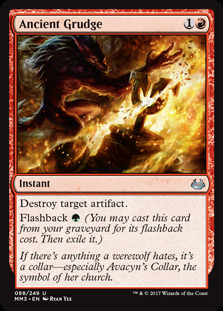 Nature's Claim is more artifact hate but also significantly enchantment hate for cards like Rest in Peace and Blood Moon . Golgari Charm is a card I added to my sideboard for testing. 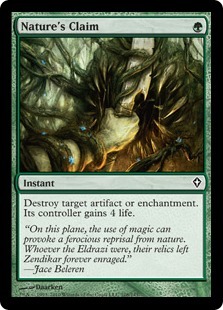 It destroys Rest in Peace and Leyline of the Void and also has utility against token and Elf decks etc. I think it's a card worthy of consideration. Darkblast is an addition to one in the main deck. 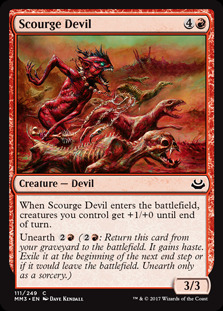 As mentioned it kills a lot of creatures and is very powerful against certain decks as repeated removal. Rally the Peasants is a card that you can cast from the graveyard which can substantially speed up your clock for games where you need to win quickly. 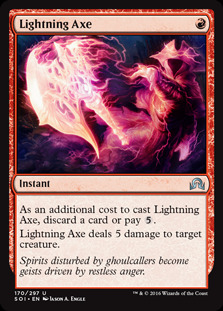 It can also help you get extra damage under an Ensnaring Bridge if your opponent isn't hellbent. 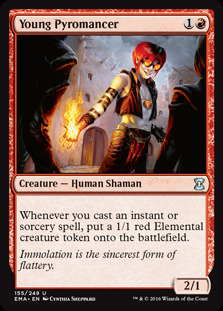 I wasn't overly impressed by this card in testing and would probably cut it from the sideboard. MTGO replays seemed to have a problem with the Dredge mechanic which made recording these videos more arduous that usual. Sorry if the videos are a bit choppy as a result. Our first matchup is against Jeskai Control. This matchup seems pretty favourable. Our deck does not rely on casting its spells so counterspells are not very effective against us and Wrath effects also aren't terribly good as our creatures thrive in the graveyard. Our threats matchup up favourably against a lot of their answers which is good. 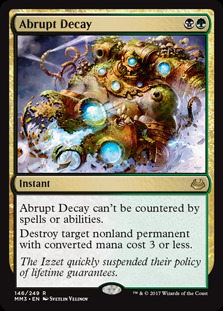 Post-board we need to watch out for hate cards like Rest in Peace and Abrupt Decay is a good card to bring in. Our second matchup is against Mono-Green Tron. This matchup seems favourable too provided we get off to a quick start. There is some risk of them landing a Wurmcoil Engine which is a big problem for the deck but not impossible to deal with. Post-board we get Ancient Grudge which is a pretty powerful card against Tron. Our third matchup is against Rakdos Hollow One. These two decks are similarly styled but Hollow One hits harder while Dredge is looking to go wide. This does gives us a good chance of blocking their threats. Stinkweed Imp is a good blocker for their threats and a strong card for this matchup. I think the problem here is they are better at aggro which puts us on the defensive which is not really where our deck wants to be. Our final matchup is against Eldrazi & Taxes. Going wide is effective against their deck as they generally only roll out a few slower threats. The Taxes aspect isn't overly scary of us as we ideally aren't casting a ton of spells so really it's the top end Eldrazi that are the main concern. Post-board again we need to be watching out for Rest in Peace and other graveyard hate cards. Overall, I was not too impressed with Dredge. It's a very all-in strategy as it's heavily invested in the graveyard and although you can beat a Relic of Progenitus it's very difficult to beat a Rest in Peace or Leyline of the Void if you don't pick up an answer in your opening hand. Also, the pay-off for being so all-in isn't always all that great. Putting a tapped 3/3 creatures on the board and a 1/1 flyer along with the many other potential plays is underwhelming and just in general the deck is high variance. You can build an impressive board but sometimes you just put a few fairly small creatures onto the battlefield which your opponent can handle. 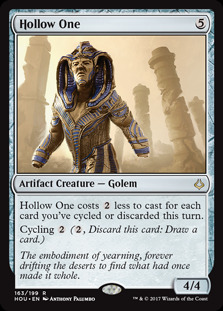 Certainly in the current metagame, I feel Hollow One provides a more powerful option that is less easily disrupted by commonly played hate cards.